A good rule of thumb is that if something needs to be wheeled in, it's probably expensive. This is the JoySound Festa. It's an on-demand karaoke system from Xing, a Japanese karaoke company (no, it's not from Nintendo per se!). 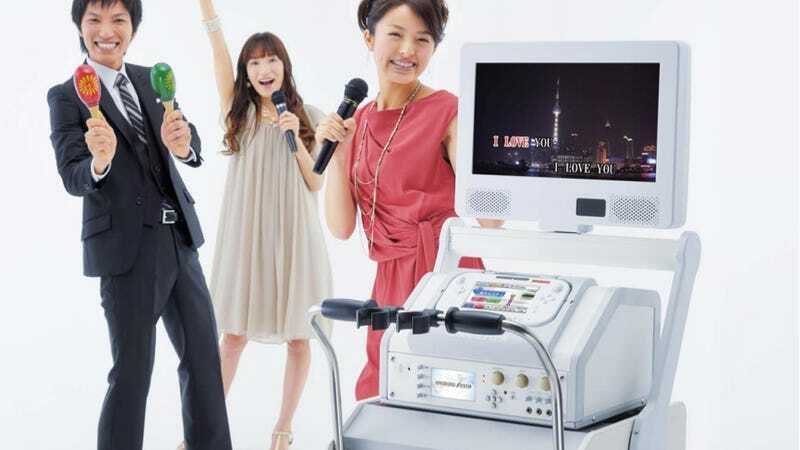 According to Sankei, the set-up uses the Wii U's software, the Wii U GamePad, and Wii U karaoke game Nintendo x JoySound Wii Karaoke U, but comes with a monitor can tilt and tilt, an enormous stand, microphones, and more added content. Besides offering 90,000 songs, the system also has exercise vids, vocal exercises, yoga clips and dance instructional clips, among many other videos. There are also puzzles and quizzes as well as brain training exercises. This isn't a consumer product, but rather, a commercial one, aimed at hotels and nursing homes. Going on sale this May, it's priced at 1,580,000 yen. That's nearly US$16,000.